This comnpter-generated image reveals the view an observer might have watching Flight Day 2 heat shield inspections for the space shuttle Atlantis during NASA's STS-117 mission. Five years after NASA?s shuttle Columbia disintegratedduring reentry and killed seven astronauts, the agency looks to test new safetyfeatures even beyond the upcoming launch of the Atlantis orbiter. Columbia waslost in 2003 after a piece of foam insulation fell off the external fueltank and struck the shuttle's wing during launch. That allowed hot gas to seepinto the wing as the shuttle later reentered the atmosphere, with catastrophicresults. NASA spent the next two and a half years and $1.4 billion preparingits remaining space shuttles for a return to flight. "Unfortunately, none of us will ever really know howmuch damage occurred on Columbia," said Steve Poulous, NASA's orbiterproject manager. "But we believe that if damage were to occur today, wehave the capabilities and tools to deal with it." One such tool acts as a caulking gun that can fill cracksbetween the shuttle's heat tiles and door seals. Called a Tile RepairAblator Dispensor, T-RAD mixes two compounds together to form a pink, goo-likematerial. Shuttle Atlantis will carry T-RAD as a safety precautionwhen it launchesFeb. 7, but astronauts on the following STS-123 mission — slated to liftoff no earlier than March 11 — will test the device on some spare damagedtiles. Poulos noted some arguments about whether the T-RAD materialwill "come out in a foam-like fashion" in the vacuum of space, asopposed to its usual consistency of "toothpaste or peanut butter. "NASA ran a series of tests under vacuum conditions on Earth, without seeing achange in the pink goo. "My personal expectation is that it's going to performin orbit exactly as we've seen on the ground," Poulos said. Finding spots that need repair is another matter. 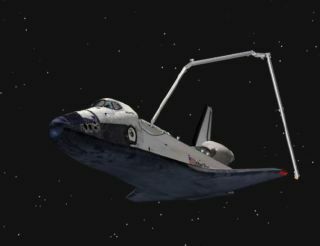 Eachshuttle now performs a "Rendezvous Pitch Maneuver" upon approach tothe International Space Station by flipping 360 degrees, allowing the stationcrew to photograph virtually the entire vehicle. The next part of shuttle inspection involves the OrbiterBoom Sensor System (OBSS), a 50-foot pole with cameras and laser sensorsthat deploys after the shuttle docks with the space station. The shuttle'srobotic arm grabs one end of the pole and scans along the edges of the wing andthe nose cap — not unlike waving a wand over an airport passenger. "It takes about six hours to do," said Stan Love, STS-122mission specialist, in a NASA interview. "It?s a long day. We?ll rotatefour of our crew members through it, so just about everybody gets a shot." Continuous practice since Columbia has allowed bothastronauts and NASA analysts on the ground to move more smoothly through thechoreography of safety inspections. "As people become familiar with tools and the datawe're getting, what took 36 hours on the first flight now takes anywhere from 12 to 24 hours," Poulos said. NASA also continues to redesign the shuttle's external tankin order to prevent possible damage in the first place. Air bubbles inside the foaminsulation can build up pressure under some circumstances and cause foam piecesto pop off, according to John Chapman, NASA's external tank project manager.The aerodynamic pressure of a shuttle launch may also reach into small cracksto detach loose pieces of foam. Solutions involve spraying foam on so that air bubbles don'tform, or removing unnecessary foam blocks. Electric heaters now warm theattachment points between the shuttle and external tank to keep them ice-free,replacing the large foam blocks such as the one that fell off and doomedColumbia. A new external tank modification will similarly removeexcess foam from the icefrost ramps that protect the brackets between the vessel?s externalplumbing lines and orange exterior, although Atlantis and the following shuttlemission will use the older version of the tank. That upgrade, which willreplace the brackets with new versions built from titanium, is expected todebut during the planned April launch of the shuttle Discovery, NASA engineershave said. "We're not in a rest-on-our-laurels position,"said Chapman. "We look at data from each and every flight, and incorporatethat into tank design and production."